The Japan Aerospace Exploration Agency’s exploration spacecraft Hayabusa2 is engaging in unprecedented research of the asteroid Ryugu. In late September, two exploratory rovers were separated from Hayabusa2 and touched down on Ryugu, and around late Janusary of 2019 Hayabusa2 itself is scheduled to also land on the asteroid, in the first attempt ever at collecting subsurface samples from an asteroid. The results of this research are hoped to help in discovering the origins of the planet and understanding evolution, as well as being useful for planetary defense in protecting Earth from asteroid collisions. 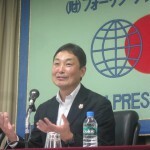 The FPCJ invited Hayabusa2’s project manager Dr. Yuichi Tsuda, an associate professor at the JAXA Institute of Space and Astronautical Science, to speak about topics including the mission’s successes so far, future exploration plans and why their significance, and international cooperation. The briefing had a total of 18 participants, including journalists from France, India, Russia, Singapore and US.